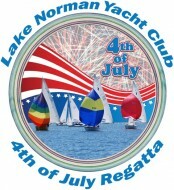 The Lake Norman Yacht Club invites you to the 2015 Independence Day Celebrations and Regatta! This 3-day event includes our 1st Annual Family Fun Day on Friday, and the Regatta Saturday and Sunday. There will be great sailboat racing, games for the kids, dinner Friday and Saturday, awesome fireworks and more! Come join the fun. Friday, July 3rd is our 1st annual LNYC Family Day. Activities start at 11:00 am and go until its dark, when you get to view our renowned fireworks display. Please bring your own picnic lunch and prepare to relax and have fun. We will be offering paddleboard lessons for a fee, plus games for the kids, and beer for the adults, provided by Lake Norman Brewing, and entertainment for all ages, provided by Cap'n Dar. Things are heating up--and not just the weather again! Friday - Dinner is sold out, but if you didn't make reservations, not to worry--bring your own meal and join us anyway! A few spots are still available in the 1:00 pm Standup Paddleboard class on Friday. Sign up through the Event Storefront, or by contacting Louisa Cox. The 3:00 pm class has been cancelled, due to lack of reservations. Saturday/Sunday - 47 boats are currently registered--including 9 of our brand-new 420s! We will be christening the entire fleet of 12 boats on Saturday morning, during the Competitors' Meeting. Check-in & Late Registration have been moved to the Pavilion. Saturday dinners are still available--go to the Event Storefront, or contact regatta co-chair Patrick Rykens. The regatta t-shirt design has been unveiled! Get your technical fabric (UV protective) short or long sleeve shirt by ordering through the Online Storefront. Hurry though! Shirts must be ordered no later than THIS SUNDAY, JUNE 28!